Natasha flashes her SHIELD badge at the soldiers and acts as a first responder, helping to find survivors. * Underneath the wreckage she finds a woman in a cowboy shirt who is unharmed and asks "Am I to be activated" before walking away. Natasha finds a room full of Nazi iconography, a massive portrait of the Red Skull and a cyogenic-style chamber with the door open. Natasha goes back topside and starts giving out orders to the Israeli troops on the scene. She radios in to Nick Fury and explains that the incident is unrelated to her search for Ms. Marvel. I'd really like to see some more things like this. 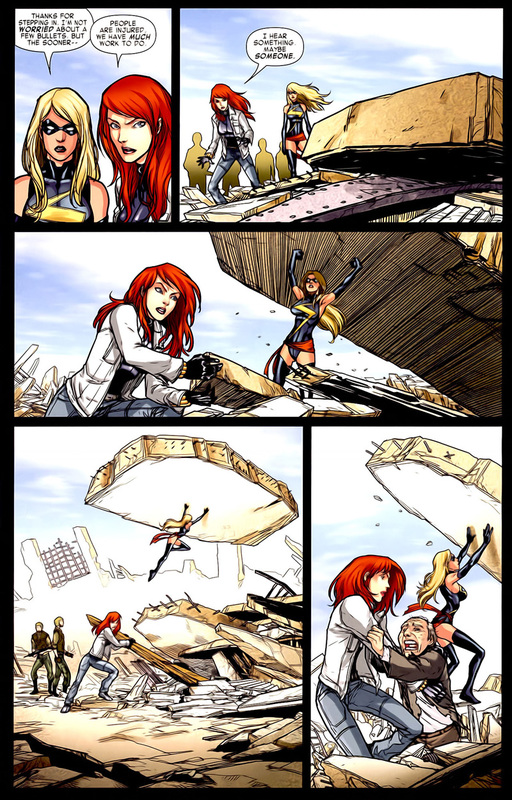 Superheroes helping out during disasters, rather than just punching things. And Carol's seventh sense kicks in.